ANAHEIM, Calif. /California Newswire/ — Anaheim-based Esperanza High School Cheer and Song Leaders are hosting Team Up for St. Jude Spirited by Varsity – Game Day, a spirit week to raise funds and awareness for St. Jude Children's Research Hospital(R). The Aztec cheer and song teams are enlisting students and fans to help sideline childhood cancer and other deadly diseases by cheering on the Cardinal and Gold at Brea Olinda High Stadium on Thursday, October 2, 2014, at 7 p.m.
As the Esperanza Aztecs take on the Brea Olinda Wildcats, the cheer squad is partnering with Varsity Spirit(R) – the leader in cheerleading and dance team, camps, competitions and apparel – and encouraging students and fans to tackle a cause off the field by participating in special events leading up to kickoff and throughout the game. Esperanza High School is donating a portion of funds collecting during a miracle minute Thursday, October 1st on campus to help ensure families never receive a bill from St. Jude for anything – including treatment, travel, housing and food, so they can focus on what matters most – helping their child live. On game day, cheer and song squads will be selling rooter poms in school colors, with all proceeds benefiting St. Jude. "The students, staff and coaches are excited to participate in Team Up for St. Jude Spirited by Varsity – Game Day," said Lyndsie Olson, Esperanza's head cheer coach. "By coming together as a school and igniting Aztec spirit, we have the chance to really help children fighting to beat cancer and other deadly diseases so that one day they, too, will be able to join their high school in spirit week. It's the best feeling." In the past three years, Varsity has raised more than $1.5 million for St. Jude and every dollar raised through Team Up for St. Jude Spirited by Varsity guarantees St. Jude has the freedom to focus on what matters most – saving kids regardless of their financial situation. For more information about Team Up for St. Jude, please visit http://www.stjude.org/varsity and http://www.EhsCheerSong.com . St. Jude Children's Research Hospital is leading the way the world understands, treats and defeats childhood cancer and other deadly diseases. St. Jude has the world's best survival rates for the most aggressive childhood cancers, and treatments invented at St. Jude have helped push the overall childhood cancer survival rate from 20 percent to 80 percent since we opened more than 50 years ago. St. Jude is working to drive the overall survival rate for childhood cancer to 90 percent in the next decade. St. Jude freely shares the breakthroughs we make, and every child saved at St. Jude means doctors and scientists worldwide can use that knowledge to save thousands more children. Families never receive a bill from St. Jude for treatment, travel, housing and food – because all a family should worry about is helping their child live. Join the St. Jude mission by visiting http://stjude.org or following St. Jude on https://facebook.com/stjude and https://twitter.com/stjude. Esperanza High School Cheer & Song is the home of the 2014 USA National Champions. The Varsity Squads are recognized on a national level for advanced level skills and industry excellence. Members of the cheer and song squads are able to confidently lead a crowd, and show a tremendous amount of school spirit. Cheerleaders have advanced level tumbling and stunting experience while song leaders are strong technical dancers. 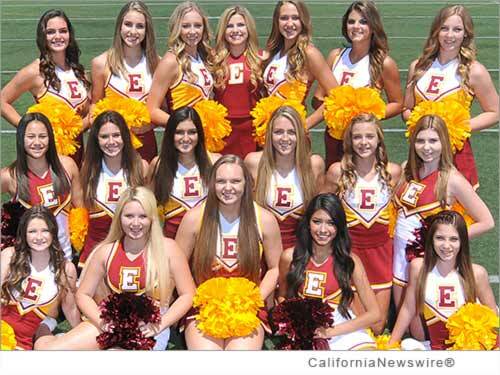 To learn more about Esperanza Cheer & Song Leaders by visiting http://www.EhsCheerSong.com/ or following on https://www.facebook.com/Ehscheersong or https://twitter.com/EHScheersong .